Meet Jacob Smith, your good-old British policeman. But Jacob's no ordinary beat bobby. He's a tactical firearms officer; a handsome, popular, financially secure specialist. He's a connoisseur of fine cinema, who also enjoys his expansive collection of do-it-yourself 'art' DVD's (the latest of which was 'borrowed' during a drugs warrant). And he likes to keep himself in shape, hence the large steroid habit - and the even larger amount of money he owes his dealer. And did we mention he's partial to women'sfeet? The girlfriend who's desperately trying to shrug him off? Or what about his parents' dark past? 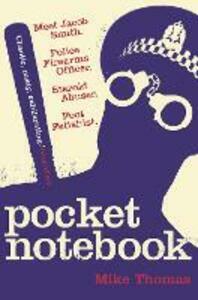 Pocket Notebook is the brilliant debut novel from serving police officer Mike Thomas. An angry black comedy, it follows Jacob's very public fall from grace, all of which he meticulously records in his police notebook.